Welcome back to Monday Motivation and Happy Labor Day! 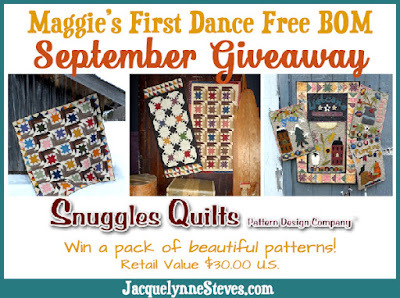 This week is Block number 4 for the Jacquelynne Steves Block of the Month for Maggie's First Dance! Find out how you can receive this free BOM pattern by visiting Jacquelynne's website! This month I kept my block simple. I used Denyse Schmidt Katie Jump Rope Fabrics for the prints. I love the retro look of the entire collection for Free Sprit Fabrics! With Summer almost ending, it was nice to get this last bit of sunshine color into this block. I used only four colors of Aurifil 50wt thread. The threads are strong yet thin. For thread painting they are perfect. There were spots I had to go over many times and there was no breakage! Fabulous threads! 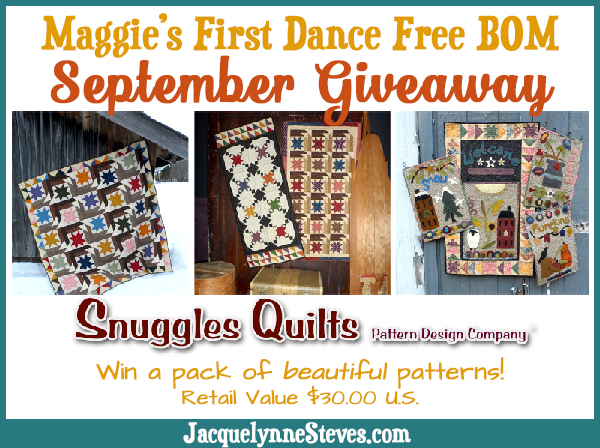 This month's giveaway is a great collection of patterns from Snuggles Quilts! Visit her website to find out more! This giveaway will close on Sept 11 at 11pm EST. The giveaway is open to all our international friends! One lucky random winner will receive the prize package of patterns in the photo above! To enter this giveaway please leave a comment answering the question, " What season is your favorite and what colors does that season bring to mind?" I do really like this block! I've not made the others in Jacquelynne's series this time, but I may have to make this one! It would look sweet as a mini quilt on my sewing room wall. Spring is my favorite season and it brings fresh pastel colors to mind for me. Pinks, yellows, light green, lavender...all the pretty sherbet colors as the earth renews itself after a rough winter. My favorite season is fall and the colors it brings to mind are oranges, browns, reds and yellows. Your thread painting looks so good. My favorite season is Spring. Colors that I think of are all shades of green. Thanks for the giveaway. I love fall when/if it finally arrives in Texas! Sometimes it seems that we skip directly to winter but other years, we have gorgeous colors of yellow, rust, red, and orange. I love fall because where I live it may be warm or cool. Lots more clothing choices! Halloween is my favorite. Purples and black are the primary colors. Then orange and lime green. I am amazed at all the originality in the construction of these blocks! I am torn between fall and spring. The relief from heat or cold is so appealing to me. Spring colors are my favorite and make me think of aqua, red, yellow and pink! I love the yellow in this block! 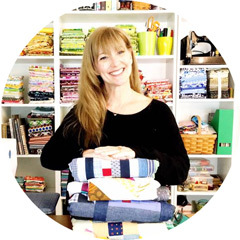 You have picked some wonderful fabrics for you blocks and I look forward to seeing your completed project. Fall is my favorite time of the year and of course it is because of the wonderful color combinations that illicit the inspirations for many, many quilt projects. I love the multiple shades of gold and brown and really like to combine them with rich purples. Oh boy! That's a toss up. I love spring, because here in the Northland, our winters are so dang long!! Favorite colors for spring are peach, aqua, pink. But then I do adore fall and whenever I see red and orange, I think of fall. Yellow really makes this block pop! Summer is my favourite season. I makes me think of the many shades of green in my garden. I love every season - transitions are the best! Colors also transition with varying shades of Reds, Greens, Blues and Yellows. My favorite season is fall. All of the colors of the changing leaves make the country side come alive in all of its beauty. I especially love spring and fall.....when the weather is more temperate....with beautiful clear colors of sky blue, flowery pinks and yellow and grass green and autumn bringing those glorious rusts, browns, reds and oranges. What a wonder of creation! My favorite season is spring with colors of yellow and pink and purple. I love spring, when everything comes back to life! It brings to mind greens, pinks, and beautiful blue like the sky. Spring is my favorite season and it brings to mind the color green. I think my favorite season is Spring. I love the cool crisp mornings and the colors I think of for Spring is the pale yellows, greens, pink and purples. I love fall when the colors of the leaves start turning red, orange and yellow. Also love that the 100 degree Texas heat starts to cool down a little bit. Fall is my favorite season. I love the reds and oranges in the trees! I love Fall. The colors and smells of the season are some of my favorite. I love how the leaves turn colors on the trees and start to fall off. Thanks for the great giveaway. I love the burgundies of autumn. Love the Fall the the amazing colors that are so vibrant and warming to my heart. I live in New Mexico and most of the time in the fall my husband and I make our pilgrimage to the Amish country of PA to take in the breathtaking colors and the harvest. Oh definitely Autumn/Fall....love the smells and the cooler weather and the festivals....always think of orange and black because of halloween...and then the obligatory rust, brown, golds....thanks for the giveaway!! My favorite season is "Spring". The bright colors of red, yellow, orange of the tulips, yellow and whites of the daffodils, pinks of the flowering trees, and greens of the new grass and the emerging leaves. dhardenburg (at) prodigy (dot) net. My favorite season is spring - I love the bright greens and yellows of the leaves, grass, and flowers. I like the Spring season best of all..I'm partial to pastel colors of pink, purple, teal, apricot and all the rest that goes with them!! Fall is my favorite, all the deep colors that give me my inspiration when it comes to quilts and sewing clothes. Fall is my favorite season. I love the Browns, reds, golds and all the earthy tones. I love fall with all the reds, golds and browns. Such comfy colors! Autumn, maybe because I have an October b'day. I love spring! Everything starts to turn green with vibrant daffodils and the hyacinths start to bloom. After a winter of everything looking so glum, the colors seem to be more vivid! I love fall. I enjoy the rich reds, russets and oranges. Fall with golds, oranges, and reds. My favorite season is spring, when green starts showing up everywhere! I love Autumn with the golds, olive, rusts and browns!! Love your block! Spring is my favorite season when all the plants are coming up. Spring and fall are my favorites. Spring is pinks, yellows, greens and purples, fall is yellows, oranges, browns and maroon. Thanks for the giveaway. spring is my favorite season. Pastels reminds me of spring. I love fall and the warm rusts and golds! I prefer the pastels of spring and I love the cool weather that fall brings us. I appreciate the rusts, ambers, yellows, and oranges of fall. I like fall better than spring because I know winter is coming instead of a HOT, HOT, HOT OK summer. My favorite season is Fall. I love the blue sky, orange and yellow leaves on trees and purple, claret and brown leaves on the ground. I love summer. Blue skies, green grass, bright yellow sunshine and white fluffy clouds. Thanks! My favorite season is Fall but the rich oranges, golds, reds and browns of the season aren't my favorites. I really prefer rich jewel tones like blues, greens and purples. fall is by far my favorite season. I love the reds, oranges, yellows, and even the browns. I have always loved earthy colors. I like your yellow block. Spring is my favorite season and ilove the brigh spring colors. In fall I love the orange, burgundy, purple and yellow. I really love your block. Thank you for the giveaway. My favorite season is Spring and it makes me think of my favorite color--green. I love fall because of the colors of fall, orange, yellow, brown and green. I use these colors a lot in my quilting and creating. I have more of these colors than any others in my stash! Thanks. Fall is my favorite season and the colors are warm reds, oranges, browns. I love the fresh colors of the spring greens and the wild use of other colors against those greens to brighten up the world after winter. I love spring with it's bright fresh green, yellow daffodils, pink blossoms and blue skies. Your block is so happy and bright! I love the fall and the beautiful colors in nature, golds, reds, browns, oranges, yellows and greens. Fall! The cool breezes and the changing of color in our hills and mountains from their greenery to muted browns and reds and yellows calm my soul. Living in southern Mississippi, I have to say Winter is my favorite season. Cooler weather-no snow, moderate temps, hurricane season ends with the rainy season, and of course Christmas. Vibrant oranges, browns,yellows & greens of local flora & fauna. Christmas with all its colors, bright & vibrant everywhere you go. Fall is my favorite season lower humidity and the glorious fall colors of yellow, orange, red and brown spark my creative urges. Choosing between spring or fall is hard! Spring has my garden starting with all the beautiful colors after a drab winter. And fall has the rich deep colors after the humidity & heat! Fall is my favorite season. It brings to mind the greens, reds, oranges, golds/yellows and browns of autumn leaves and produce. Even though I dread the cold and snow of winter, it's my favorite because I have more time for sewing. Nothing better than working on a comfy quilt while the cold wind and snow is blowing outside!! I love blues, denims, chambray, with whites/blacks/taupes,, and it seems to work well with winter for me to keep those "winter blues" away!! Quilty hugs right back at ya!! I really like the fall season, I love the smell and the colors of red, yellow, orange and brown. Love them. Living in Surprise, AZ I like the winter, nice and cool ! I like autumn best... umber, gold, crimson,green and pumpkin are my favorite colors. I live in Australia, my favourite season is winter, this season for me is filled with the golden yellows of the wattle, light blue skies and the orange glow of a warm log fire all muted by the morning mist. Autumn is my Favorite time of all seasons! It makes me think of childhood summer's on end, getting ready to go back to school and the buzz of excitement in the air waiting for upcoming holidays! Fall is my favorite season of the year. I love the golds, browns, and oranges and especially the purples too. I love all the seasons, but for fall (one of my favorite four), which is shortly upon us in the northern hemisphere, I love the golden yellow of aspen leaves. Spring. Love the pinks and purple blossoms of many plants that bloom in the spirng. Lovely block!! I love spring best for color - fresh greens, soft pastels, just a wonderful time of the year! I love winter with the blues and white with metallic colors running through them. That's a really hard question for me because there is something I like about each season. But if I absolutely have to choose, I would say fall because it means football. Reds,yellows/golds, oranges,purples and old gold and blue (WVU colors)are the colors that remind me of fall. I love spring when everything is starting to grow. I love all the shades of green as the plants start to grow. Green is my favorite color. Thank you.